BerryIMU also works great with Windows IoT Core on the Raspberry Pi. Our Git repository contains the source files needed to get the BerryIMU up and running on Windows IoT. Raw values from the gyroscope, accelerometer and magnetometer. Fused X and Y angles. Or BerryIMU can sit right on top of the GPIO pins on a Raspberry Pi. The first 6 GPIOs are used as shown below. Download the BerryIMU code for Windows IoT from our GIT repository. The files you need are under the WindowsIoT-BerryIMU folder. You will need to download the entire git repository as GIT doesn't allow downloading individual folders. Once downloaded, double-click the file WindowsIoT-BerryIMU.sln to open up the project in Visual Studio. The project code outputs all of the needed values to the screen and a complementary filter is used to fuse the accelerometer and gyroscope angles. 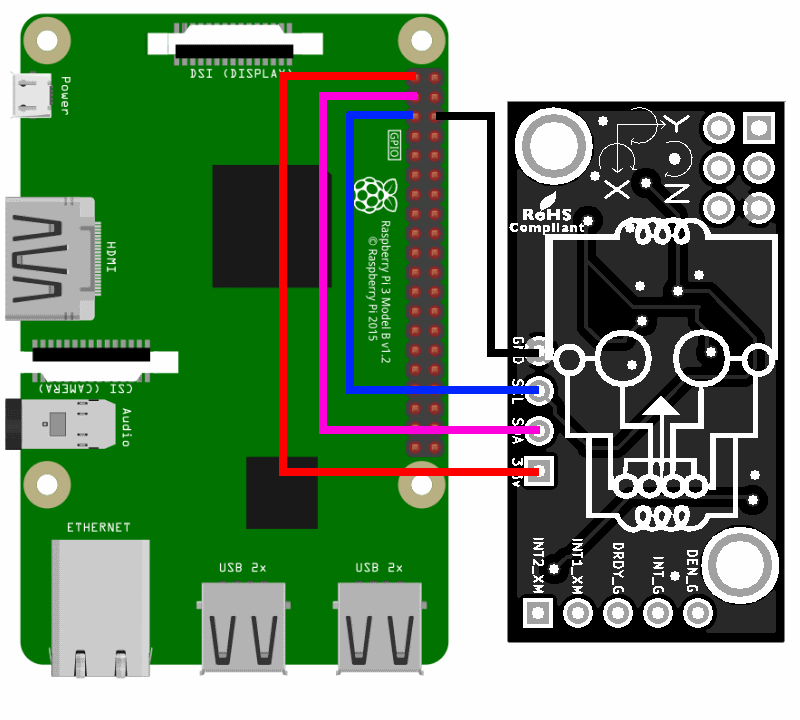 We have a number of guides already documented on how to get the BerryIMU working with the Raspberry Pi. These are based on Raspbian, however the principals and math are the same for Windows Iot. The final values which should be used are the fused X &Y angles and the tilt compensated heading. Changing how much trust is given for each of the sensors can be changed by modify the complementary filter constant at the start of the code. The loop speed is important as we need to know how much time has past to calculate the rotational degrees per second on the gyroscope. A time delta is set at the start of the code. const int DT = 100;         //DT is the loop delta in milliseconds. This is then used to specify a new timer method. Here you can see where DT is used to keep track of the gyroscope angle. You can also see it in the above calculation for the complementary filter. The calculations in the code are based on how the BerryIMU is orientated. If BerryIMU is upside down, then some of the angles need to be reversed. It is upside down when the skull logo is facing up(or to the sky). If it is upside down, set the below value to true. Otherwise, set it to false.